Dairy cows back out on the grass, after a long winter. It’s easy, after years living and working here at The Farm School, to lose sight of the splendor of the Sentinel Elm farm. On a evening like this one however, after a hot and busy day, when the cool breeze smooths out all the rough edges, when every single fruit tree is deep in flower and shedding perfect petals into the breeze, and the clear dusk sky crystallizes the details of every living thing, even the most weary of us can’t help but feel the gravity of this place. The air is an elixir, the livestock a chorus speaking of contentment, and every plant and tree is breathing deep after a hot day under the sun. The staff has put together a wonderful shared dinner; our potatoes from the root cellar cut into fries, ground beef from the freezer pressed into burgers, fresh greens from the hoop house tossed into a nearly living salad, and everyone sharing in the preparation, rejoicing in the food, and pitching in to clean up. As the pastures slowly green up and the grass gets taller and taller, my thoughts have turned to electric fences, weed whackers and mulit-flora rose. 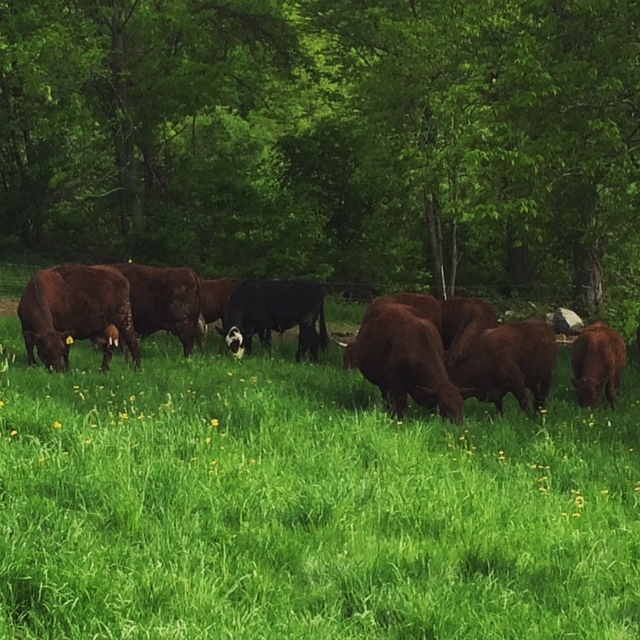 Getting out into the pastures to setup fences means walking all through every field, and allows me a wonderful snapshot of the condition of our grassland acres. Most fields look similar in the winter and early spring, but now that growth has resumed, the strength and weakness of each pasture is much clearer. I can see where the clover is growing nice and thick, where the bed-straw is filling in and beating out the other grasses, where growth seems good and where it could use some support. Our pastures have been generally headed in a positive direction over the past few years as we have been following a strict rotation plan and applying beneficial sprays as often as we’re able. However, more can always be done, and I am looking forward to enhancing our manure application this fall. We have also been looking into putting some rock dust on the fields this fall along with the manure as a way to improve the mineral content of our soil. 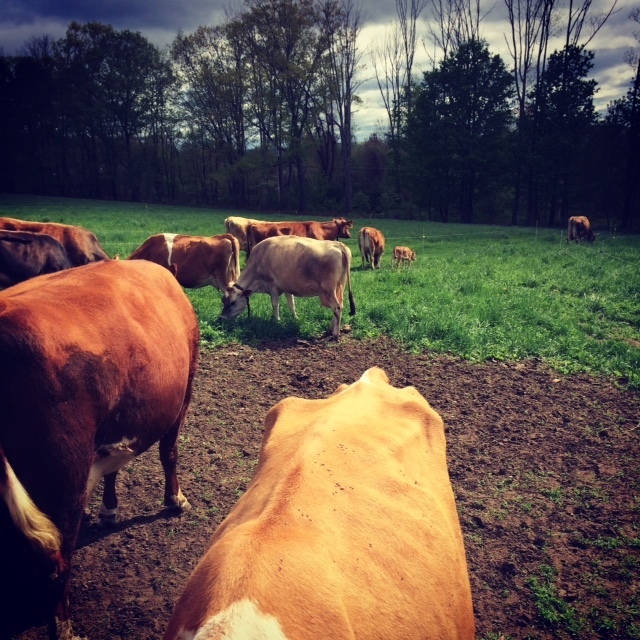 Grass quality is really a reflection of soil quality, and a focus on healthy thriving soil will lead to healthy thriving grass, and healthy thriving animals that consume it. The beef herd getting their first taste of grass of the spring. We’ve started giving all of our grazing animals little bits of pasture to start transitioning their rumens from digesting hay over to grass. We try to make the change slowly to avoid the dangerous bloating that can happen when a ruminant switches quickly from hay to the rich wet grass of spring. We’ll spend a few days giving them ever increasing areas to graze, and by the end of the week we’ll have transitioned over to full time grazing. 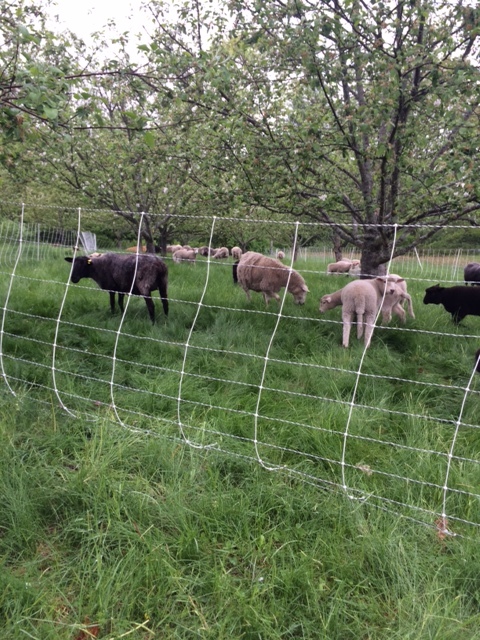 The sheep get their one chance of the year to get into the home orchard, grazing under the apple trees for a few hours a day. Orchard grazing runs the risk of the sheep becoming more interested in the leaves on the lower branches than they are in the grass, and we really want to avoid them doing any damage to the trees pulling and eating from those low branches, so we try to keep their time in the orchard brief, and we make sure that they have plenty of good grass to keep their focus downward. The sheep grazing in the orchard. Our weather station recorded almost 2/10th of an inch of rain today, our first rain in more than a month, and a much needed drink for the thousands of fresh transplants that Tyson and student farmers have been putting out throughout our cultivated fields. Our pastures, populated with perennial grasses, have a stronger root base that gives them access to the moisture remaining 6 inches deep in the soil, so the grass has not been suffering at quite the same level as the newly planted vegetable starts. However, I expect to see the pasture respond positively to this bit of rain, and it might give everyone a few days off spot watering all those transplants. 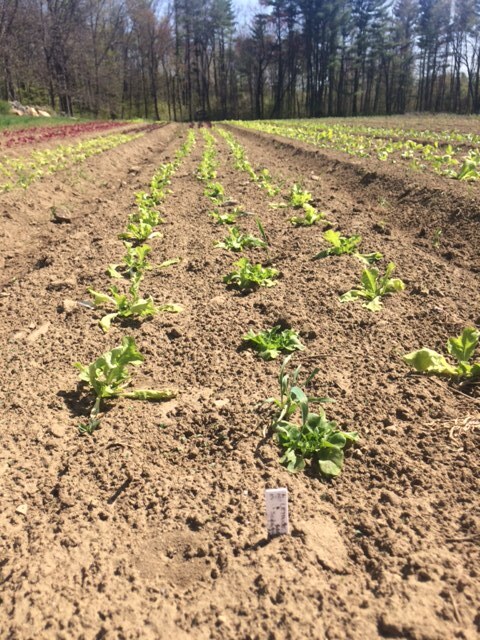 New lettuce transplants trying to hold on until the rain comes. For the third year in the row, we’re going through a little spring drought here in central Massachusetts. We had a great snowy winter, and there was ample water in the soil from the melt, so things are not too critical yet. Tyson and the student farmers are busily watering transplants in the fields to keep them going until it rains next, and our pasture growth has slowed considerably. Everyone is looking at the sky, or looking down at their phones to check the weather, and we’ve had some near misses on rain that have driven everyone crazy. Most of our insect pests, like black flies and mosquitoes, depend on wet conditions for reproduction, so one benefit of a little spring dry-spell is a reduction in the time that those bugs are around. Three little goat kids; two girls up top, and a big buck at the bottom. 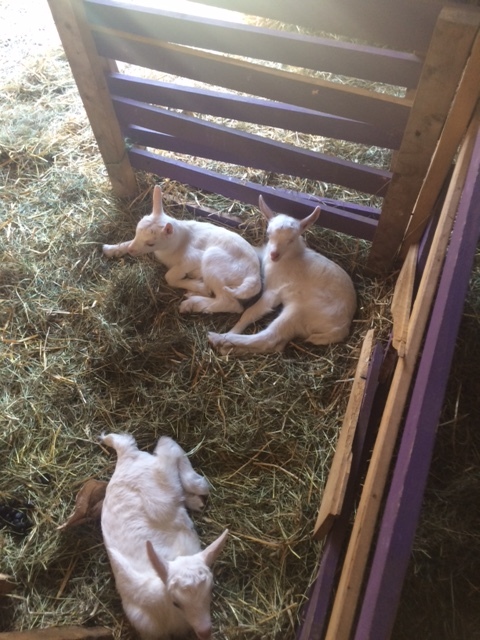 The goats have started kidding, with three little white babies out there already, and one more doe still due. Minerva had a pair of girls, Juno had a little buck, and all three are doing really well. Minerva came into the milking barn this morning for her first attempt at milking, and although she did not have much milk, she was pretty well behaved for the first go-round. Our hope is that visiting students will be able to hand-milk the goats every morning as part of chores as a nice kid-sized animal they can get their hands right on. We also hope that a nice little band of goats can help control some of the super aggressive invasive plants that are taking over our stonewalls, field and road edges, and are creeping out into the pastures all over the farm. The goats will eat the growing tip on the Multiflora rose, a totally over the top thorny monster that has designs on every open space, and they love the Japanese Knot Weed, a super fast growing, but otherwise pretty benign, leafy invasive. New chicks just moved into the brooder. 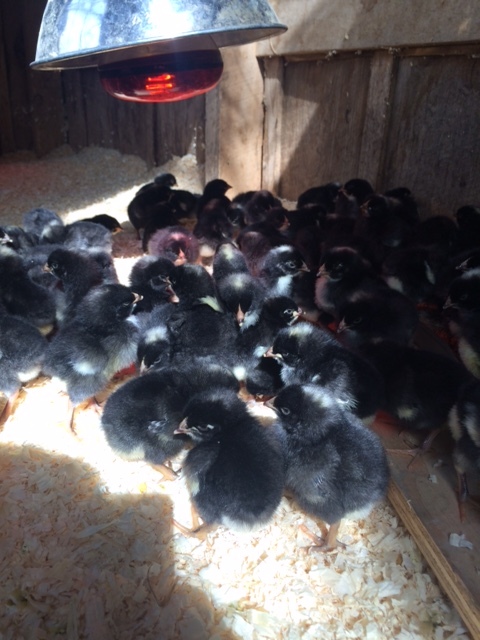 We got 115 Heavy Silver Grey Cross broiler chicks in the mail from Hoffman Hatchery yesterday morning, and they went into the brooder at Maggie’s Farm. They’ll spend a few weeks in there, growing a bit, putting on real feathers, and getting ready to launch out onto the pastures. They move into ‘chicken tractors’, which are 8x10ft houses, about 25 birds to a house, each with its own water and feeder. The houses are on skids, and the student farmers will move them every day, sometimes twice a day depending on the size of the birds. The houses have no floor, so the regular moving gives the birds access to fresh pasture every day, and leaves behind a nice even manure deposit to help the pasture grow better the next time. We’ll process the birds at about 12 weeks old and they’ll go into the freezer for our community. We’ve found that these birds, who have been given the opportunity to forage on a variety of grasses, as well as any insects unlucky enough to be in their path, end up with a lot of delicious chicken flavor. They get fresh air and sunshine, they get to express their chicken nature out in the world, and although their lives are short, they seem pretty pleasant. Rose getting after some breakfast. 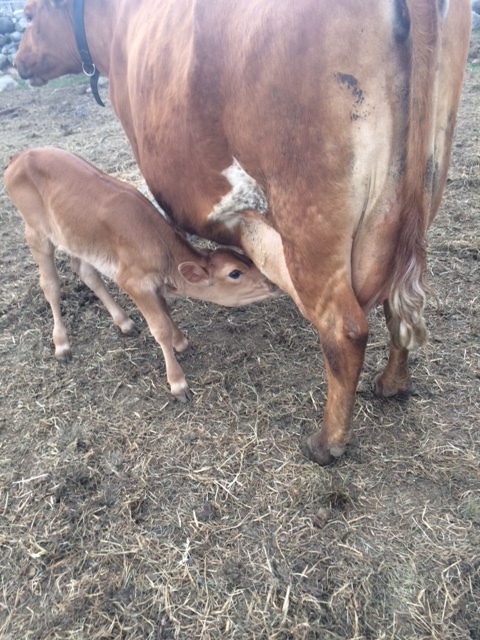 Our dairy has another new calf as of Saturday, with Red delivering a little girl we are calling Rose. Red is our best milker, so we have high hopes for her daughter. Both mama and baby are doing great, and are out on pasture, mixing it up with the herd. We expect cows in the beef herd to start calving some time very soon, but we always hope that they can wait until the herd has gone out onto the fresh spring grass. Last year we launched just about all of our grazing animals on the 15th of May, and we are looking forward to a similar date again this year. The grass has slowed a bit with the recent dry weather, but a little rain would get us right where we need to be to start the grazing season. It is important for us to wait as long as we can before starting to graze to give the pastures ample time to get well established before the pressure of grazing. Each plant needs to develop deep, strong, well fed roots before they are ready to recover from a cow or sheep eating the majority of their leaf material. These energy reserves enable the plant to quickly bounce back and start growing again, and their strength and vigor increases as they put on more surface area for photosynthesis.